One of the best locations in Morzine! 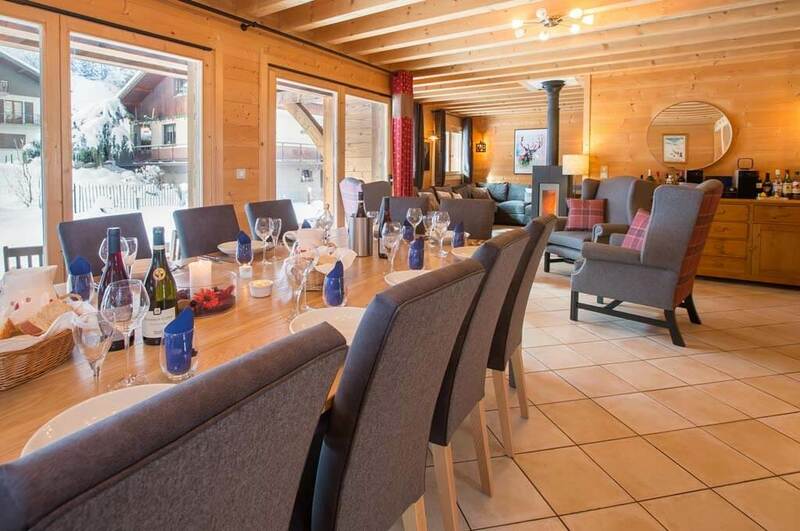 The impressive Chalet Central is ideally positioned close to the Pleney pistes in the centre of Morzine. 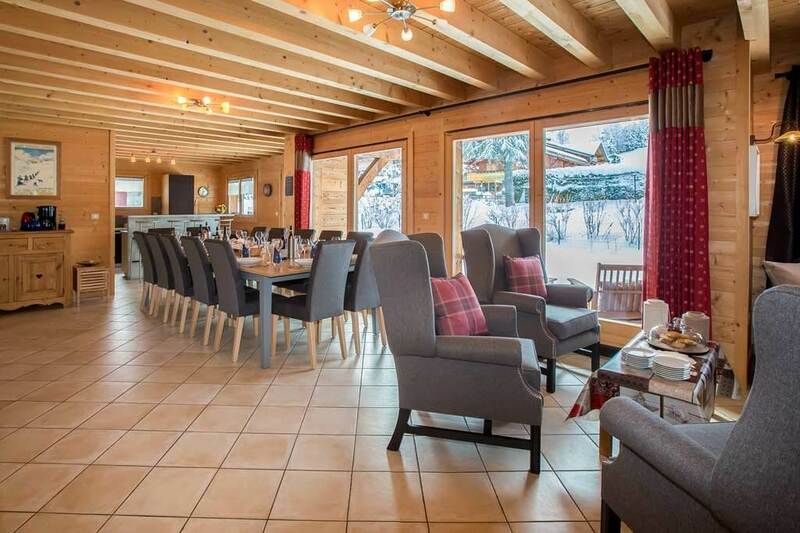 This attractive south-facing timber chalet (complete with private indoor hot tub, sauna, huge games room) sits in spacious private grounds opposite our piste-side partner ski shop, Felix Ski. There’s a drag lift only metres away giving quick slope access – whilst the Pleney cable car and the very heart of Morzine is just a short stroll. Sleeps 12-15 guests in 6/7 bedrooms. 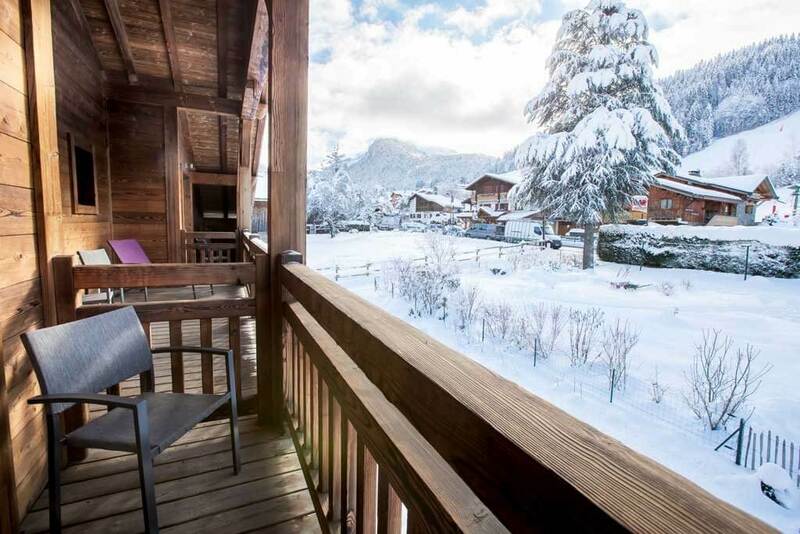 Without doubt, the location of Chalet Central is one of the most sought after in Morzine. The property boasts an enviable position that’s hard to rival. 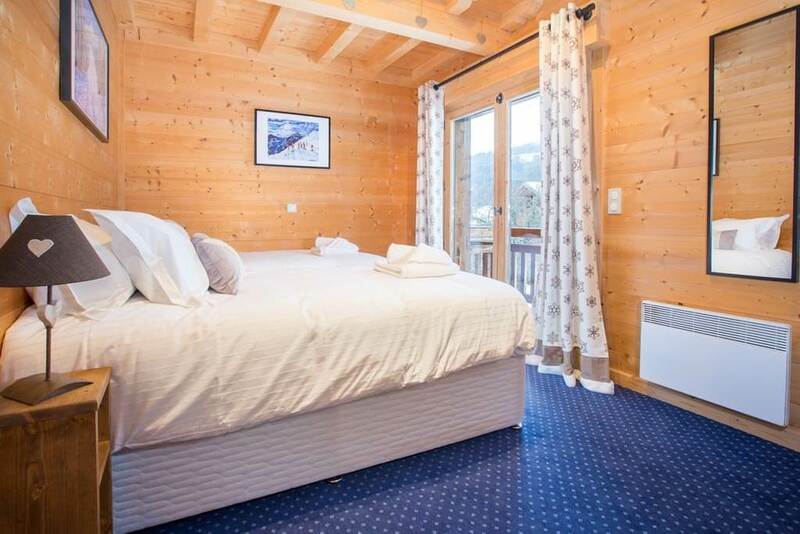 This 6/7 bedroom chalet (with games room, indoor spa & sauna) is in the centre of Morzine. It’s directly opposite our on-piste partner ski shop, Felix Ski, where there’s a drag lift entering the Morzine/Les Gets ski area. Equipment hire and slope access is effortless – whilst the main Pleney lift and resort centre is only a quick 3-minute walk. 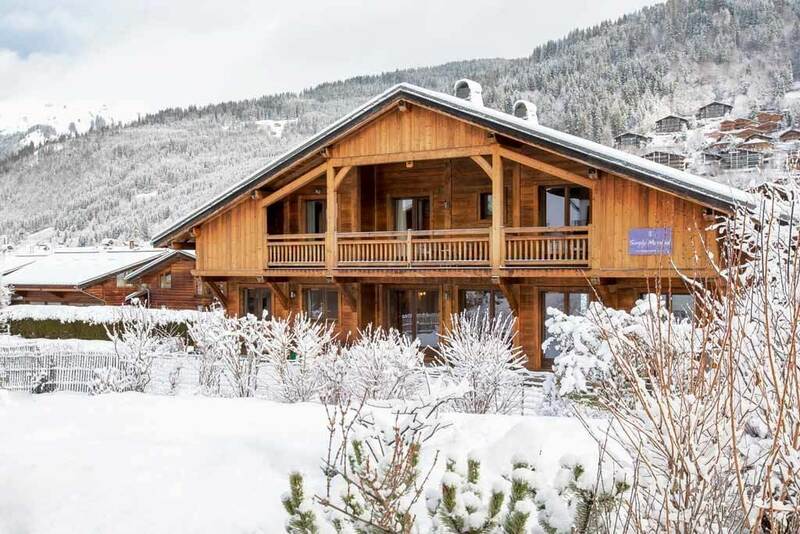 Stunning location and views aside, there’s much more to this high-quality chalet – inside and out. Chalet Central’s large glass frontage spanning the length of the exterior is striking. Inside, you’ll be welcomed into a slick and contemporary interior – balanced alongside that traditional, cosy, wintery alpine charm we adore from a chalet holiday. Now to the chalet’s focal point… You’ll enter into the spacious, open-plan, living room-diner-kitchen with feature log burner, relaxed seating in the snug and lounge areas, honesty bar, tea/coffee station and an elegant yet informal dining space. Here, guests can enjoy watching their professional chef and separate chalet host at work in the open-plan kitchen. 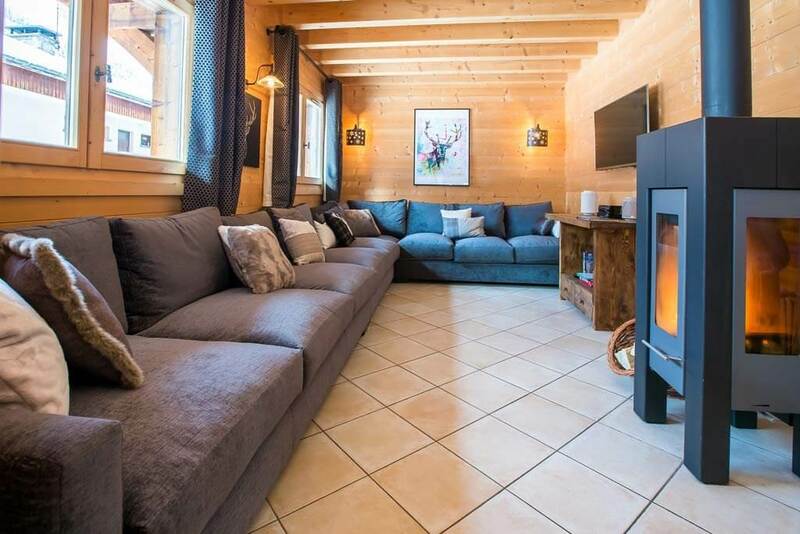 The stylish wooden-clad living room is bright and airy, with panoramic, grandstand views to the Pleney pistes that you’d expect from a chalet in such a fine location. These vistas will entice you towards the slopes – or through French patio doors to a lovely south-facing terrace/patio area which is magnificent sun-trap. Upstairs, there are 4 well-furnished bedrooms on the first floor. 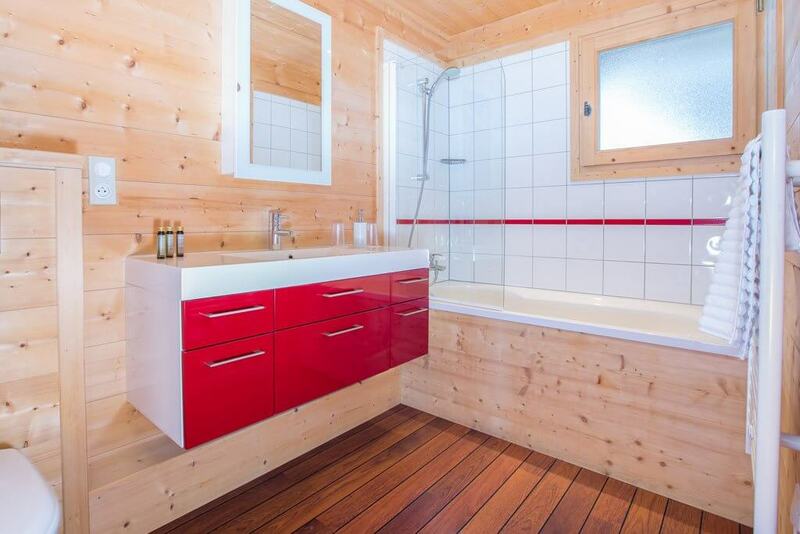 Each offers a modern, spacious ensuite bathroom (with a bath and shower) – baths are a rare find in chalet accommodation. We provide toiletries, hairdryers, bathrobes and fluffy towels. 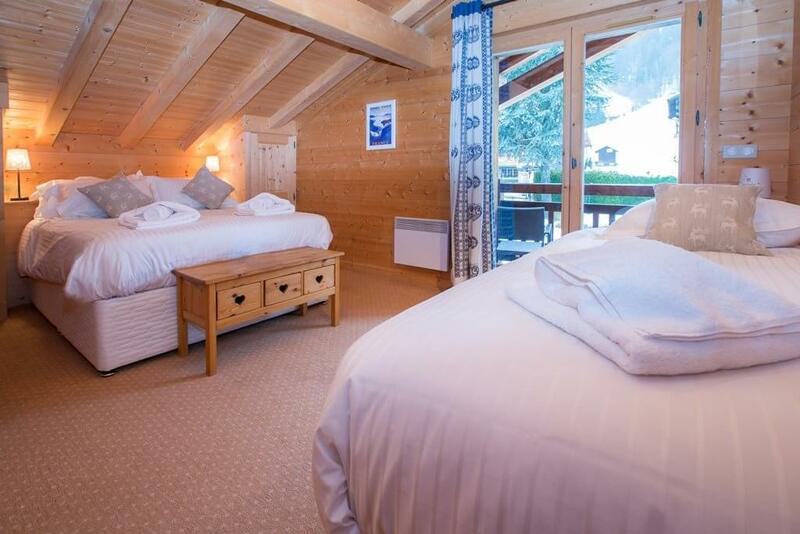 Each of these bedrooms has access to a large balcony with inspiring views over the pistes or centre of Morzine. At this level, there’s an additional TV/sofa area, which offers a very useful second living space in which to unwind. Pop downstairs to the lower ground floor level and soothe tired ski muscles in the chalet’s ‘wellness area’. 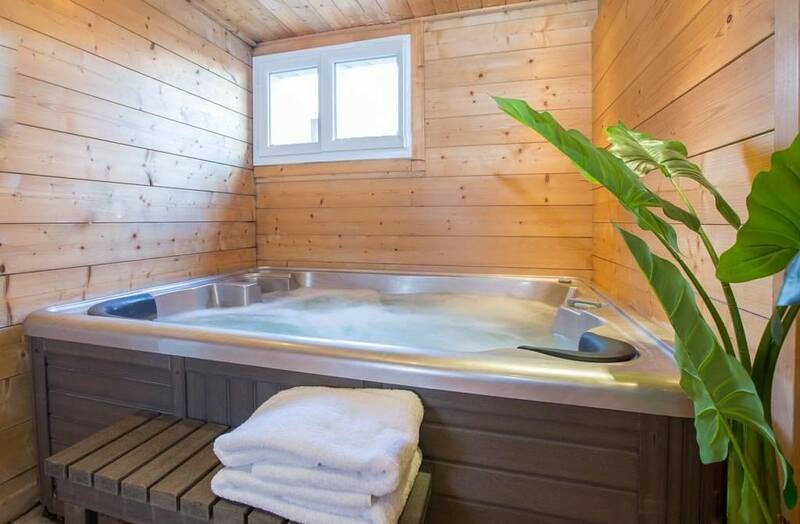 This mini spa-like haven – complete with hot tub, sauna and walk-in shower – offers an extra touch of luxury and makes the perfect place to relax after a day on the slopes. 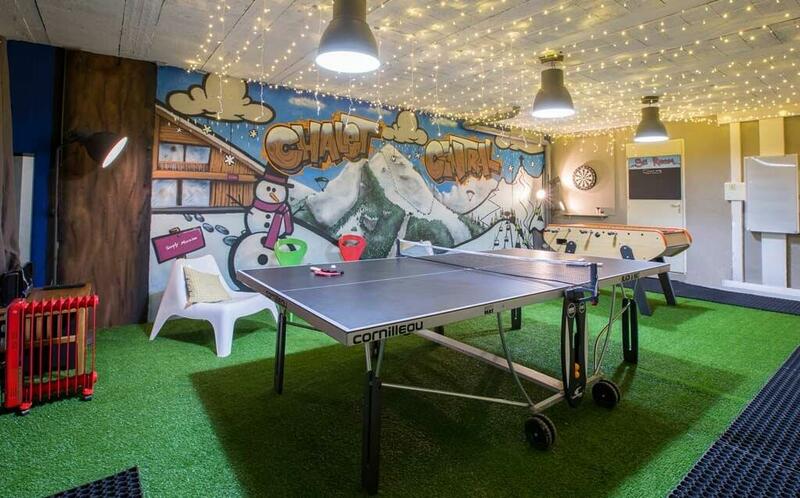 Also, on the lower ground level, have fun in the chalet’s giant converted games room, originally the garage. Equipped with table tennis table, darts, table football, sofas and Bluetooth speaker, the games room is sure to keep guests young and old entertained and amused. We think the games room is pretty unique in Morzine and helps set Chalet Central apart. The chalet sits on a large private plot and hence benefits from lots of outdoor space, something that’s rare in central Morzine. The grounds encircle the perimeter of the chalet – providing a safe area for children to play and enjoy the snow. The chalet is tucked away from the noise, hustle and bustle of central Morzine in a quiet and peaceful residential area. There’s a wide driveway with plenty of private parking, including a covered area. 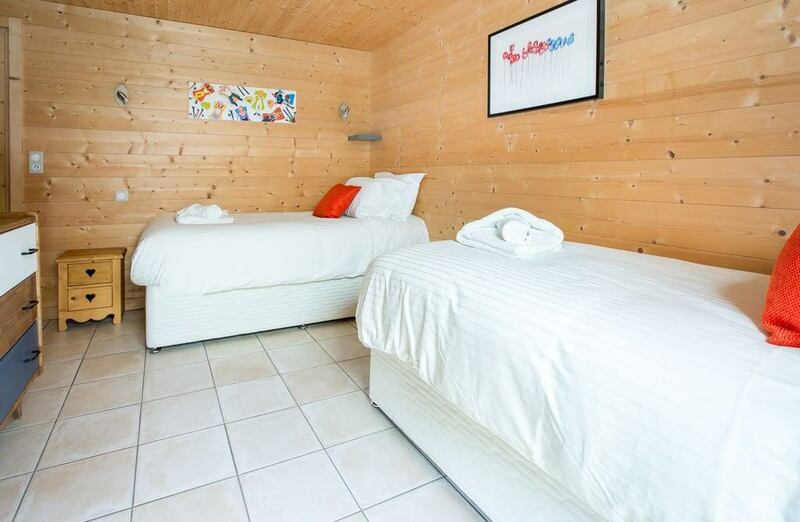 Chalet Central is ideal for medium size groups, accommodating 10 to 15 guests in 6/7 well-appointed bedrooms. Rooms 1-6 are ensuite, with an optional 7th ‘overspill’ bedroom available if required (using separate shared toilet and shower facilities). 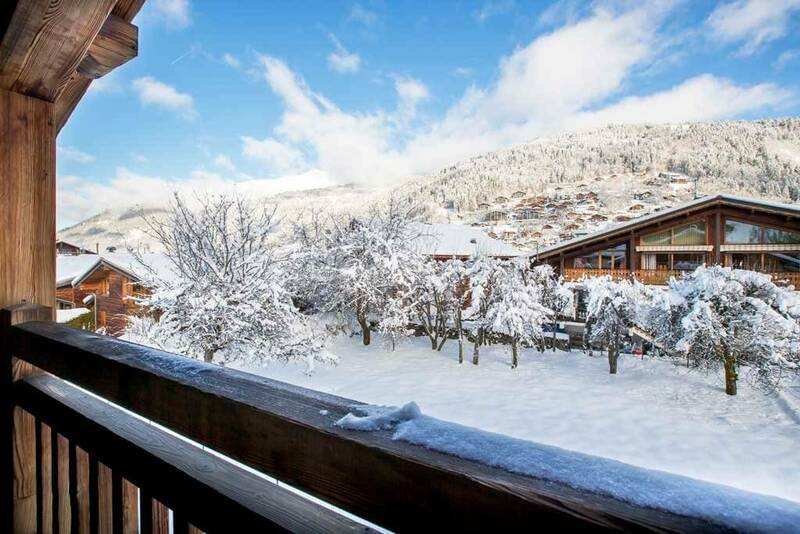 Bang in the middle of Morzine, we’re confident that Chalet Central epitomises the ethos of Simply Morzine and is ideal for the perfect winter alpine holiday. "We cannot recommend this chalet or the Simply Morzine company enough, fantastic service, food, and staff. 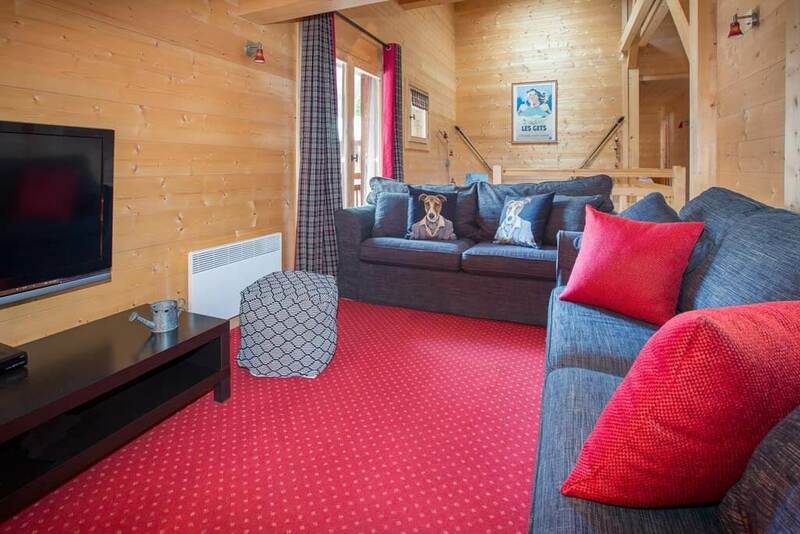 The location of this chalet is absolutely ideal as it's just a short walk to town and right opposite the slopes and ski hire shop. We had a ball!" Comments: The 6th bedroom, on the lower ground floor, has its own private access to the exterior of the chalet. 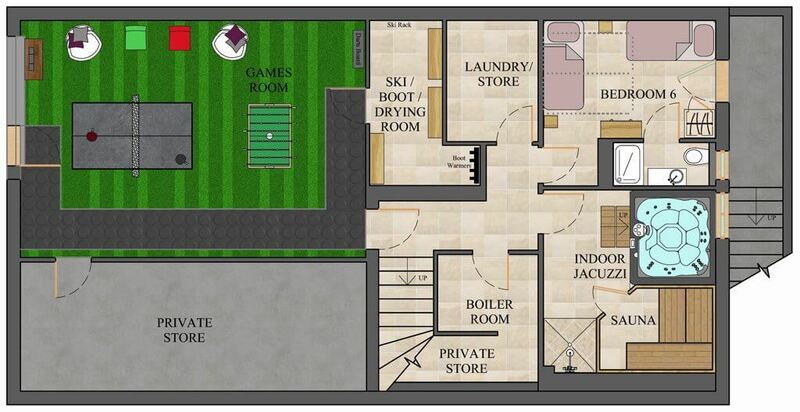 The 7th ‘overflow’ bedroom is on the upper ground floor (lounge level). Whilst this is the only room that is not ensuite, separate toilet and shower facilities are available. 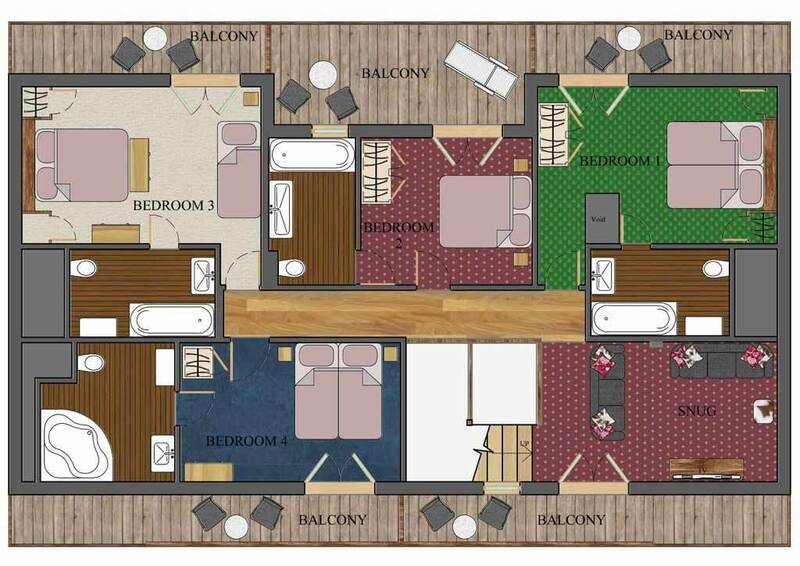 Please refer to the chalet floor plans. 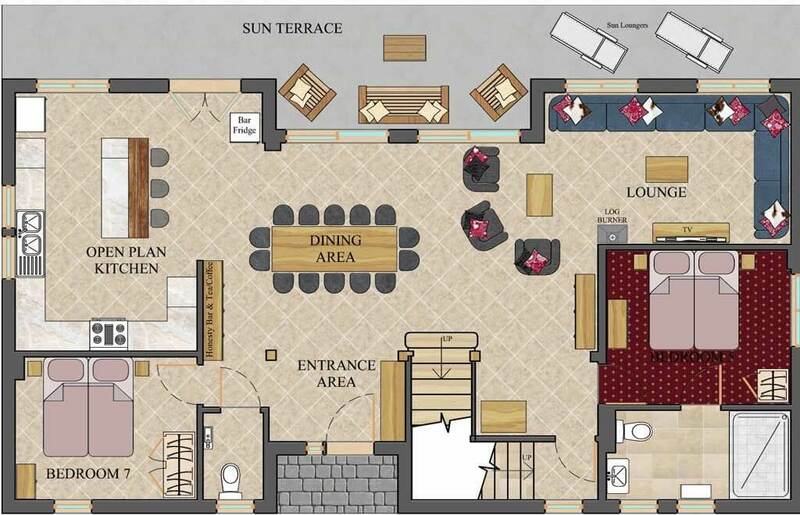 Please note: The ‘Exclusive occupancy guide price’ shown is based on 12 paying adults. The price may change based on your group size.